While on a trip in Northern Europe, I visited the Oslo Parliament building in the capital of Norway. 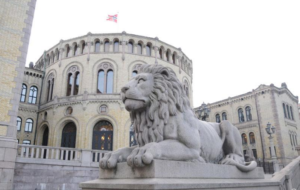 Oslo is the center for government in the country of 5.2 million people. Scandinavian countries like Norway are famous for their constitutional protections of free speech. Norway gained a constitution in May of 1814, yet censorship has been banned since 1770. On the World Press Freedom Index, Norway ranks one out of 180 countries. The United States ranks 43. These Northern European countries paint a picture of a land, where Thoreau would look on in favor. Thoreau’s ideas conflicted with the mainstream in his time; the protection for those with new ideas in some countries today would make him proud. Yet, the range of free speech protections can vary greatly around the world. On the negative end of spectrum, the first country we will look at is Saudi Arabia. Saudi Arabia is a country rich in resources, namely oil, located in the Middle East. The Saudi government consists of a theocracy headed by a king, who commands the military forces. Internet censorship is one of the most prevalent examples of free speech limitations in the country. According to Free Speech and Free Press, over 2,000 pages are blocked, including pages on religion, humor and media. The right to peaceful protest, a cornerstone of American democracy, is definitely not followed in Saudi Arabia. Activists in the country have to live with the risk that they could be injured, or in some cases killed by police. Another country with a questionable record on free speech is China. A modern superpower with over 1.3 billion people, China will imprison journalists. NPR reports that China has imprisoned a record 199 journalists. 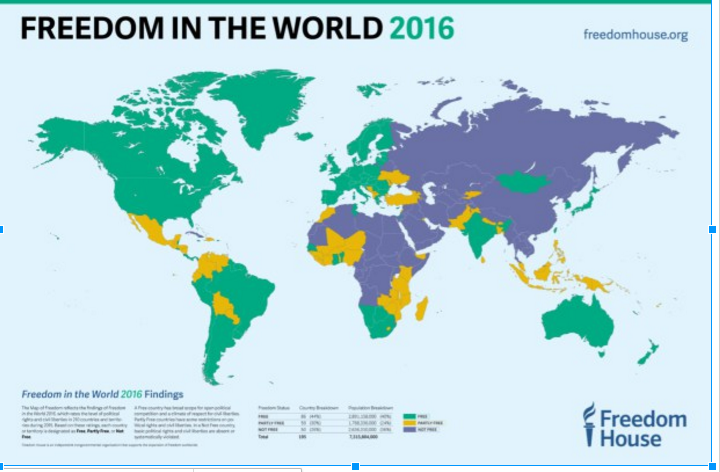 In the graphic below, from the website Freedom House, countries are ranked by their level of freedom, which is a metric that takes into account many factors. The prevalence of free speech protections is a good indicator of the stability of a country. Enough virtual globetrotting, let’s turn our gaze to home. In the U.S Constitution, the First Amendment guarantees every citizen very important rights: Freedom of religion, speech, press, assembly and petition. It allows citizens to hold different points of view and is what makes the cultural mixing pot of America so fascinating. For the purpose of this blog, we will look at freedom of speech and freedom of the press. However, the U.S is not completely free. As mentioned earlier, the U.S ranks 43 on the World Press Freedom Index, down from a ranking of 20. This low ranking on the World Press Freedom Index is attributed to the Obama administration’s aggressive prosecution of whistleblowers that included eight Espionage Act Prosecutions as well of its investigation of journalists, according to rootsaction.org. Harriet Martin is a youth blogger for The Roost and a student at Concord-Carlisle High School. Order a copy of Thoreau Farm Trust's book, "What Would Henry Do? ", a collection of essays, with President Jimmy Carter and other scholars and activists, exploring modern social, political and environmental issues. Children in Peril: What Would Henry Do? What Will You Do?